It REALLY is all beer. Trust me. When Editor-In Chief Chris Poh asked me to write a beer column for this forum, I must confess to being a bit flustered. True, I am a copious beer consumer without apology. 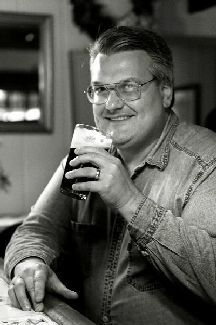 I was an avid homebrewer, for many years - owning and operating the Hunterdon Homebrew Shoppe in Frenchtown, NJ, and even worked sales for a local microbrewery for a time. Beer, for me, has always been both fun (as it should be for all) and fascinating as well. So why the problem? Well, I suppose that when you look at it, beer really is a pretty big world out there. Anyone who has ever had the audacity to step beyond the typical, mass market golden American entries into the field would know this. That being the case, it can be pretty tough trying to figure out where to begin. So, I finally decided to start from the very beginning - from the very Big Bang of fermentation. Once upon a time, several thousands of years ago, during the very dawn of what we like to call Civilization, a person came upon some grains soaking in rainwater out in the hot sun. These were grains that apparently someone was trying to fashion some kind of bread with. Let's assume it was barley, though it might well have been wheat, or spelt. Anyway, it was discovered that the grain had been soaking for several days and it had changed the color of the water - in fact, even some tiny bubbles could be observed rising to the surface. Curious, the onlooker proceeded to drink from the strange water and discovered it had a palatable, slightly sweet taste. After drinking it all, he even began to notice a pleasant sensation that he had never experienced before. After sharing this amazing discovery with his friends, it was not long before barley fields were being planted so that this amazing liquid could be reproduced. So was the birth of beer, and possibly that of organized agriculture as well. What had happened in this case was that the starch in the partially-germinated barley grains (what we call malt) was converted into sugar (maltose) by the water and sunlight upon enzymes present in the barley. Wild yeasts in the air then proceeded to ferment the malt sugars to produce ethyl alcohol and carbon dioxide. Although far more efficient, the process for producing beer today is basically the same. The difference is that temperatures, types of grains, and species of yeast are produced and controlled with scientific precision. So, now we have beer and ale, right? Well, it is not that simple. In America, people like to say that “there is beer, and there is ale,” as if ale was not true beer. But ale is beer, believe me. Ale is a beer made from top-fermenting yeasts (which tend to rise to the top of the vat during fermentation) and ferments at a warmer temperature, usually around 60 to 70 degrees. India pale ale, porter, and stout all fall under the category of ale, as well as the unique beers of Belgium. What folks in the U.S.A. like to call beer is known as lager. Conversely, our fellow drinkers in the U.K. like to say “there is beer, and there is lager,” as if only ale is true beer. They are as incorrect as the Americans on this point. Lager is beer that is fermented using special bottom-fermenting yeasts (which tend to settle out quickly) and is fermented at much cooler temperatures (usually around 45 to 50 degrees) and then are cold-conditioned at temperatures hovering slightly above freezing. Most (though not all) German beers fall into this category, as well as Bohemian pilsners, and most big-market American beers. Now that I have that controversy cleared up - yes, it is ALL BEER!! - I can proceed to talk about beers and the breweries that produce them, in upcoming issues.